The Management Team at Colorado Lighting, Inc. believes that our people are our most important asset and that the preservation of employee safety and health must remain a constant consideration in every phase of our business. It is our intent to provide a work environment as free of hazards as possible. To accomplish this, Colorado Lighting has established this Safety and Health Manual to protect the safety and health of our employees. This manual is developed to meet occupational safety and health regulations and holds management’s highest priority, support, and participation. The intent of this manual is to be flexible and allow for updates as required to meet changing work situations and regulatory requirements. Colorado Lighting, Inc. management will make every effort to provide a safe and healthy work environment and ask its employees to assist in this effort. All employees are responsible for working safely and productively, always remaining aware of hazards in their jobs and following recognized safe work practices, including the use of personal protective equipment (PPE). Colorado Lighting, Inc.’s success in any program is dependent on cooperation and commitment from all of our employees to deliver the best energy solutions to Denver clients and beyond. 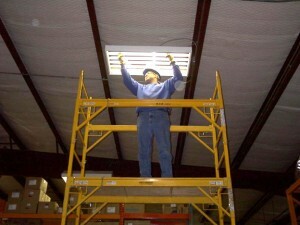 All Colorado Lighting, Inc. employees and visitors are required to comply with these programs. Each newly hired employee will be made aware of the contents of this Safety and Health Manual as part of their initial orientation. Additional policies and specialized safety orientations will also be provided. Let us work together to ensure a safe and healthy work environment. Contact us today to see how optimal safety practices help us to provide top-quality lighting and energy services.